The root bark of Paeonia suffruticosa Andr. of family Ranunculaceae. Fragrant smell, slightly bitter and astringent taste. Large, thick, white cross-section, and easily made into powder, strong fragrant, profuse crystals. Dried under sunshine, unprocessed or stir-baked with alcohol. Bitter, pungent, light cold; heart, liver and kidney meridians entered. Clear heat and cool blood, activate blood and resolve stasis, reduce deficiency heat. It can clear heat from nutrient and blood system, and excels in resolving stasis with its pungent nature. With the characteristics of cooling blood without leading to blood stagnation as well as activating blood without leading to bleeding, it is much suitable for treating syndrome of heat entering blood system in warm diseases which is manifested as fever aggravated at night, macula or papule, hematemesis and apostaxis. It can be combined with other blood-cooling, toxicity-removing and bleeding-stopping herbs so as to reinforce its action of clearing blood heat as well as prevent the side effects of blood-cooling and bleeding-stopping herbs in aspect of congealing cold with blood stasis, for example, Shui Niu Jiao, Raw Di Huang and Qian Cao Gen, etc. It excels in activating blood and resolving stasis, therefore it is wildly indicated for irregular menstruation, amenorrhoea, abdominal mass and traumatic injury caused by blood stasis; and being cold nature, it is much suitable for treating blood stagnation with heat. For irregular menstruation accompanied with transformation of depressed liver qi into fire, it is often combined with menstruation-regulating herbs, such as Zhi Zi, Dang Gui, Shao Yao in Dan Zhi Xiao Yao San from Fu Ren Da Quan Liang Fang. It has strong effect in resolving blood stasis, and is not too cold in nature, so it is used to treat the syndrome of congealing cold with blood stasis, and often combined with meridian-warming and blood-activating herbs, for example, Gui Zhi, Dang Gui and so on in Gui Zhi Fu Ling Wan from Jin Kui Yao Lue. For pain and swelling due to traumatic injury, it can be used with Mo Yao and Ru Xiang which excel in activating blood and curing trauma. With the basic actions of clearing heat and cooling blood as well as activating blood and resolving stasis, it can take effect of curing abscess, dissipating nodulation and stopping pain. So it is commonly indicated for sores and abscess with swelling pain no matter in body surface or internal organs which is caused by fire-toxicity accumulation and blood heat stagnation, and is often combined with herbs of clearing heat and removing toxicity and herbs of curing abscess and dissipating nodulation. For intestinal abscess in initial stage due to accumulation of blood stasis and heat; it is combined with Da Huang and Tao Ren in Da Huang Mu Dan Pi Tang from Jin Kui Yao Lue. It clears deficiency heat for its liver and kidney meridian entered property. 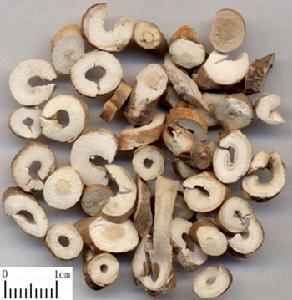 For the terminal stage of warm disease with lingering pathogenic qi manifested as yin-fluid consumption, bone-steaming without sweating, fever aggravated at night while alleviated at morning, or lingering low-grade fever, it is often combined with yin-nourishing, deficiency fever-lowering herbs such as Bie Jia, Qing Hao, Zhi Mu, etc. , as in Qing Hao Bie Jia Tang from Wen Bing Tiao Bian. 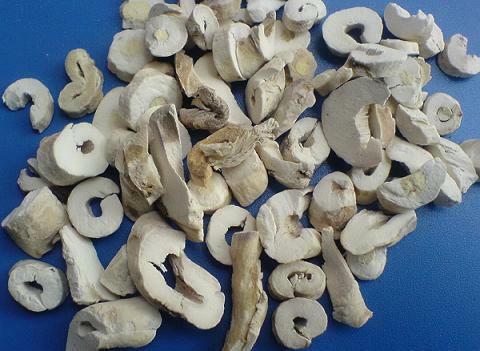 For liver and kidney yin-deficiency manifested as vexing heat in chest, palms and soles, tidal fever and night sweat, it can be used with Di Huang and Zhi Mu, etc. , as in Zhi Bai Di Huang Wan from Yi Zong Jin Jian. Decoct 6~12g. The raw one is better for clearing heat and cooling blood while the one stir-baked with alcohol is better for activating blood and resolving stasis. It is contraindicated in cases of profuse menstruation and pregnant women.